At one time Sydney creases were clumped into the Simian category too. Many turn of the century writers take note of the single crease. They also take note when it's the heart line doing the transversing and the head line doing the transversing but they didn't know it was the Sydney line because those guys in Sydney may have not been born yet to name it. I think it's in the category of Suwon because of Accessory II. Because of the nature of the II + III you are already dealing with the concept of a simian crease. Patti wrote: From quotes posted earlier from Plato's book there is no such thing as the long transversing crease being just a single crease, as in just a long heart line or a long head line transversing from side to side. Are you 'thinking out loud' here? a complete merging of the heart line & head line, which leaves the 'impression' that actually one of both lines is missing (since normally we see 2 lines). This requires e.g. the presence of a normal head line... which implicates that regarding a 'Suwon crease', for sure: one can not speak about that line as a 'simian line' variant. 2 - The simian line requires NO EXTRA LINE, but there is a 'merging of lines'!! Patti, does this makes sense? These words describe the fundamental differences between 'Suwon crease' and the 'simian line' - basically there are really no similarities at all!!! But we noticed from the beginning that there were some complications involved in their presentation!! So, I think I have now described very explicitely the ROOTS of this confusion - and this also shows that it is really necessary to think beyond these 'formulas'... because obviously: these forumales have a highly confusing side-effect if one starts using them literally!!! I EXPECT THAT ... ANYBODY WHO CAN NOT ACCEPT THESE BASICS (POINT 1 + 2), WILL CONTINUE TO MAKE MANY, MANY, MANY OTHER MISTAKES IN DISCRIMINATING THE LINES INVOLVED. Patti, I hope that you will soon recognize the relevance of the point that was initially brought up by Lynn (and afterwards I confirmed very explicitely that you for sure made a mistake regarding how you read the Plato-quote). Anyway, thank you again for sharing your thoughts... because now I am very aware why the 'formulas' are not as simple as they may look like! Yes Patti, that is indeed a part of history. But really... the Sydney line was discovered in 1969 more than 40 years ago!! So, since then this problem was sort of solved already!! 2 - The simian line requires: NO EXTRA MAJOR CREASE, but there is a 'merging of major creases'!! I think it is these words that cause the confusion between us. I don't really think the Suwon crease has always an obvious "EXTRA LINE" that obviously originates on the radial edge near the life line and rises to meet the heart line. II + III is accepted in the scientific community as representing the simian and the joining of the head and heart lines. We both seem to agree here. In the Sydney, sometimes there is an obvious "EXTRA LINE" that appears originating on the ulnar side and perfectly meeting the head line. Sometimes it looks just like the head line is singularly crossing the palm. It is still II + III and Accessory III. Does this discrepancy make sense? Because otherwise, I read what you write and it sounds like you're saying *no* to me and telling me I'm confused and then repeating most of what I just wrote in agreement in your own words. 2 - The simian line requires: NO EXTRA LINE, but there is a 'merging of lines'!! oops! Turn of the century! I meant late 1800's and early 1900's. Sorry! I don't really think the Suwon crease is always an obvious "EXTRA LINE" that obviously originates on the radial edge near the life line and rises to meet the heart line. Yes Patti, I agree that this is indeed the essential difference between our thoughts. But somehow, you are ignoring the fact that the Suwon crease forumula very explicitely describes that there really needs to be an EXTRA MAJOR CREASE involed. Obviously, you have made the 'assumption' that researchers might also have included examples when there is no EXTRA MAJOR CREASE involved. But where did this 'assumption' take you...? Now you even have started describing a CLASSIC SIMIAN LINE VARIANT (= your last example) as a 'Suwon crease'! Meanwhile, I have made no assumptions at all!! It took a while... but now I finally know that I arrived at a point where I can start thinking about how to write an article about the Suwon crease!!! And I won't forget to include a special word of 'thanks' for you! You can remind me to this promise, but I won't forget to mention your name!! Please... time for me to got to bed , time for you to wake up!! Just because you think you are right and I am wrong is no reason for you to respond rudely. It certainly doesn't give me any additional confidence in you being right. I will agree that we are talking about simian variants. The Sydney and Suwon are simian variants. You want to say the Korean researchers were not clear when they used the symbology of II + III to describe the interaction of head and heart lines. Yet, they emphasize in that the whole concept and purpose behind their report was for clarity in defining the creases of the palms. Exactly what Kimura and Schaumann said was needed. In this process and research they 'happenstance' noted something special about a particular simian variant, identified it and named it the Suwon crease and added it to this report. If we ignore the rules they lay out to follow on how to recognize and categorize all creases, including the Suwon crease, then that's acting as if the report is flawed. And I don't think the report is flawed at all. They were quite on top of what they were doing. Even to the point of recognizing their formula for T-DoT works best on square palms and would have to be adjusted for 'tribes' with longer palms. Perhaps you need more justification yourself to point out the Korean's were mistaken and you are keener at knowing what they meant to say than what they actually said. If they do not mean II + III and Accessory II is the Suwon Crease, Then I'll be happy to call it the Cincinnati Crease and go on from there. Am I *all heart* or what!!! As tempting as it might be, I really don't want to respond any further on this thread. I was torn at even giving it any more time as I am now, after your mean spirited remarks, not just tonight, but earlier in this discussion. Patti wrote: Just because you think you are right and I am wrong is no reason for you to respond rudely. It certainly doesn't give me any additional confidence in you being right. Sorry Patti, I never meant to express my self with a "rudely" response... but so far I am not aware that I did. Is it rude to tell somebody 'time to wake up'? Is that the example that you have in mind? And I am also not aware that I made any "mean spirited remarks". Where did I make such remarks??? I would appreciate if you show me where I did with a quote (you can post it here, or you can send it via PM). I am willing to apologize when appropriate, but right now I can only apologize for any misunderstanding involved. But I am sure that you understand that I can not apologize for anything that I am not aware of. PS. I am only aware that you described one of my edits (earlier today) as 'unfair'... but I hope that is not a part of your related feedback, because I think there is nothing 'unfair' about making an edit just to avoid further confusion. 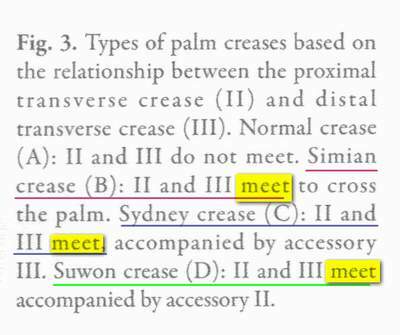 Because there is only a vocabulary similarity between how the Korean researchers have described the simian line (II+III), Sydney line (II+III plus accessory III), and the Suwon crease (II+III plus accessory II). But this for sure does not implicate that the Sydney line and Suwon crease can also be described as a 'simian line' variants. Remember, in the past 40 years the Sydney line was described as one single line, and not as a 'combination line'. And in this perspective I am inclined to say that the confusing side-effect of the formulas especially applies to the formula of the Sydney line... because it suggests that EVERY Sydney line is a combination line. Because since the work of Purvis-Smith both the Sydney line and the simian line have each been described as a different major crease variant. And that is why each line variant was described by the Koreans through a different formula. Patti, I could explain this through the example of apples and the pears... both have similarities... and both belong to the fruit species. 'all pears are apples' or 'all apples are pears'. Patti wrote: At one time Sydney creases were clumped into the Simian category too. Many turn of the century writers take note of the single crease. They also take note when it's the heart line doing the transversing and the head line doing the transversing but they didn't know it was the Sydney line because those guys in Sydney may have not been born yet to name it. Patti I hope you don't drop out of this discussion. I'm a bit confused by your above comment. Maybe because I'm not aware when Sydney lines (or long transverse head lines) were clumped into Simian category. Although the long transverse headline had not been called a 'sydney' yet, it is still a headline with a separate heartline. You rightly say that "Many turn of the century writers take note of the single crease.They also take note when it's the heart line doing the transversing and the head line doing the transversing". but that's talking about a SINGLE crease. (ie in position of headline it was 'head dominant' simian and in position of heartline it was more 'heart rules head' Simian). 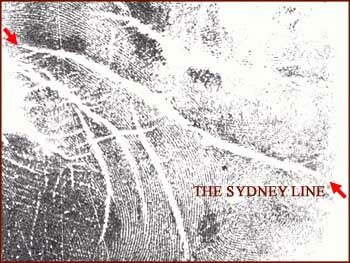 But as you know, the Sydney also has heartline present, so how is it included in the writers noting a single crease. ? sorry if I've missed your point. Yes exactly: you've described the major difference between the Sydney line and the simian line. And for that reason ... a 'Sydney line' should NOT be discribed as a 'simian line variant'. However... from Patti's feedback I recognize that because the 'II+III' element is found in the Korean forumula for not only the simian line, but also the Sydney line AND the Suwon crease... I now recognize that the formulas themselves (edit after Lynn's comment:) CREATE some additional confusion. EDIT: But I am also aware that this problem will only manifest when people start interpretating the meaning of certain aspects in these forumulas. And therefore I still think that the Korean researchers did a phantastic job... and basically there is no need to change anything in their article. However, when people start these forumulas in 'out of context' considerations then unwanted side-effects can shows up. That is probably the only thing that I really learned from our discussion at this forum - next to that this discussion has been very helpful for me to become aware of the details that are really required to recognize a Suwon crease..
And therefore one can not understand the hand-fundamentals behind of these formulas without the accessory comments + illustrations in the article. The forumales are not detailed enough for that purpose. how does my observation regarding the side-effect of the Korean formulas sound to you? I thought when Martijin showed the prints and gave the information that the Suwon crease, as it says, is a crease, not a line or a branch, but an actual crease. So this would make it, indeed, a noteworth discovery Am I right? 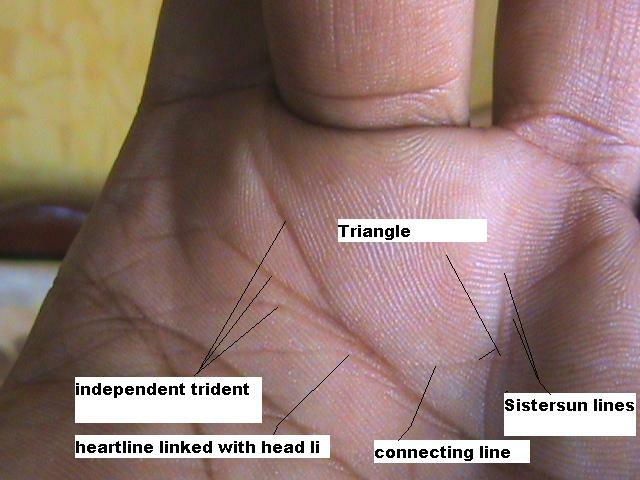 "Crease" is the word that scientists use to talk about the palmar lines, such as the "Simian Crease" instead of simian line, "Distal Transverse palmar crease" is the heartline, 'proximal transverse crease' is the headline etc. So basically it's a line! (but they are trying to categorise it as a particular formation of line). Thanks Lynn, yes that is correct. One could also that the words 'creases' and 'lines' are sort of synonyms. - and the accessory creases (= all other lines that usually have no specified name). - I never described NOR SUGGESTED that the Korean article is flawed. I only described that if one starts analysing the Korean forumulas in 'out-of-context' considerations (focussed on the 'II+III' aspect)... only then these formulas can induce biased side-effects, resulting in confusion. Anyway, I perceive Patti's summary as... 'a world-upside-down'! PS. Again, it was not me who criticised the Korean article on multiple aspects!! But this for sure does not implicate that the Sydney line and Suwon crease can also be described as a 'simian line' variants. Martijn (admin) wrote: .....However... from Patti's feedback I recognize that because the 'II+III' element is found in the Korean forumula for not only the simian line, but also the Sydney line AND the Suwon crease... I now recognize that the formulas themselves CREATE some additional confusion. ............ And therefore one can not understand the hand-fundamentals behind of these formulas without the accessory comments + illustrations in the article. The forumales are not detailed enough for that purpose. Yes I agree with you Martijn. And this is what Patti's saying I think - that the formula could describe many variants on the Suwon line that are different to the illustration in the article. The article gives us a few more clues in accessory comments & illustrations. But still, I think it needs expanding on by the authors, because obviously it has created confusion. A bit ironic really, as their aim was to improve the analysis of palmar lines and make it clearer! Lynn wrote: Yes I agree with you Martijn. (by the way I think you made a typo - you wrote CREASE, did you mean CREATE?). Thanks Lynn, great to hear that you can confirm my observation regarding the side-effect of the formulas. By the way, yes - I have recognized the 'irony' of the situation as well... but I can also understand that the innovation does not solve all 'old problems'. And let's not forget that the hand lines provide quite a few unknown mysteries, because basically it is a very complicated phenomenon (where the individual elements should not be considered apart from the 'full picture'). I think Lynn & I provided you some answers. But did we answer the question that you had in mind regarding the 'vocabulary'? Nothing to be embarrassed about Jeanette. When some doubt comes in, it's much better to ask than keep wondering. I know that feeling of 'overload', as you described - feeling I don't know anything about hands - but I've discovered it usually comes just before a major surge of understanding! So, keep warm, happy reading & very soon you'll get that 'lightbulb going on above your head' and all the ideas will come together! anyway this Suwon discussion is a very confusing & long thread. I have to keep going back & re-reading the messages. What you said is very encouraging and has made me feel better. Can we recongnize this palm have a suwon crease or just heart line splitting towards head line? No, this is a rather normal 'splitting heart line'. NOTICE: None of the branches continues to the thumb-side of the palm, but more important: I see no 'extra head line' either - which implicates that both of the major characteristics of a Suwon crease are... missing! So I think it is definitely not a Suwon crease. NOTICE: In the picture below the 5th hand describes the essential characteristic of a Suwon crease; the Korean article (where the Suwon crease is defined) e.g. describes that the two head lines are required to be positioned 'parallel' and none of both lines should be longer than twice the length of the other lines. "III is accompanied by accessory palm creases which are parallel and more than half of the III length." This quote describes the requirement for an accessory III line, but can likewise be applied to an accessory II line (which is included in the Suwon crease formula: 'II+III' plus 'accessory II'.